Construction on the A2 has so far has included more than 250km of dual-lane, high-speed, toll operated motorway between Konin and Swiecko. 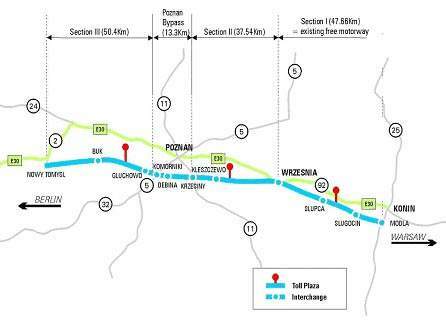 Map showing the three sections of the phase one project and the Poznań bypass. The A2 toll motorway is the first public-private partnership (PPP) project to be undertaken in Poland. Finance is an issue for some of the sections of the A2 motorway and negotiations are ongoing. The A2 toll project is part of the massive infrastructure-restructuring programme currently underway in Poland. 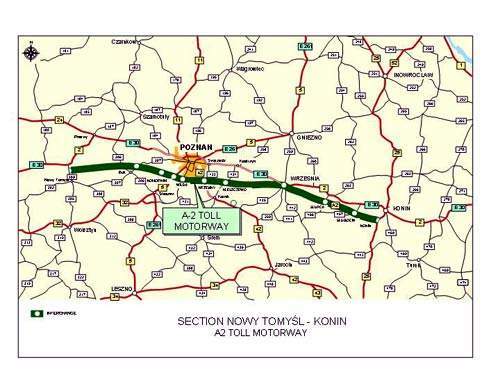 In October 2000 the Polish minister for transport and marine economy announced that a concession agreement had been signed which defined the financial plan for the construction of the A2 Nowy Tomysl to Konin section of the A2 motorway in Poland. A consortium of 18 Polish companies, Autostrada Wielkopolska SA (AWSA), was awarded the contract under a build-operate-transfer arrangement for a concession period of 37 years (until 2037). The project, overseen by the General Directorate of National Roads and Motorways (GDDKiA), has required an investment of €828m for the first segment and is one of the largest privatised transportation projects ever experienced in Poland. The Polish Government hopes to construct more than 2,500km of motorway by 2015. 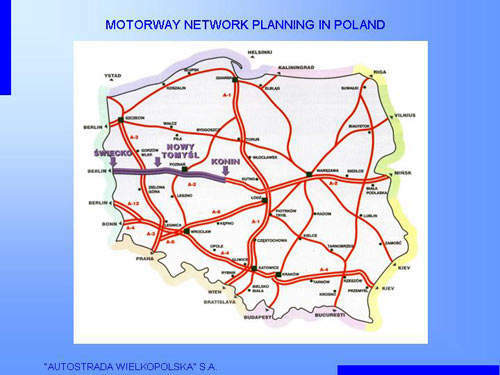 The A2 motorway (610km) will run through Warsaw to connect with Germany (German A12 autobahn) in the east and Belarus in the west, as a part of the planned East-West Trans European motorway (2,500km) Berlin to Moscow route (part of the E30). The Nowy Tomysl to Poznan to Wrzesnia to Konin stretch of the A2 (segment I) is approximately 150km and has been open since 2004. Financially appraised in early 2004, segment II extends beyond Nowy Tomysl to Swiecko near the German border, making the road 250km long. Construction on segment II from Nowy Tomysl to Swiecko, which is 106km long, began in July 2009. It was completed in November 2011, almost six months before the planned date. Section II of the roadway has been constructed in seven subsections and was officially opened on 1 December 2011 with an investment of €1.3bn. This section will remain toll-free until mid-May 2012. The Strykow to Konotopa stretch is 91km long and will be built in sections. Negotiations for sections A and C were completed in July 2011. The 29km section A will be undertaken by Eurovia-Warbud consortium, while the 20km long section C will be undertaken by the Boegl & Krysl – DSS consortium. Under the terms of contract, both the sections will be completed by October 2012. The 100km section from Konin to Strykow (near Lodz) was completed in July 2006. "The project, overseen by the General Directorate of National Roads and Motorways (GDDKiA), has required an investment of €828m for the first segment and is one of the largest privatised transportation projects ever experienced in Poland." Work on the toll motorway began in 2001. Construction was split into three sections, the 47.6km stretch from Wrzesnia to Konin, 37.5km from Kresiny Interchange in Poznan to Wrzesnia and 50.4km from Nowy Tomysl to Kormorniki Interchange in Poznan. AWSA shareholders formed two companies for the A2 project. The first was a development company – A2 Bau Development, founded by STRABAG and NCC International and responsible for design and construction, while the second was an operating company – Autostrada Ekspolatacja SA, founded by Transroute International SA (main shareholder of AWSA), Kulczyk Holding SA and STRABAG. In order to ensure the company adhered to the terms of the concession, the GDDKiA appointed WS Atkins (UK) as an independent engineer to supervise the design and construction process. Construction work was carried out by two main contractors – STRABAG Polska and NCC Polska – and comprised paving the road surface, building new bridges, repairs and renovations of existing structures, rehabilitation of the pavement, drainage works, 23 sewage plants and the installation of 3m x 1m amphibian culverts and nine animal passages (seven bridges and two passages). In addition, 29.5km of noise barriers, between two and six metres high, were constructed and 150 oil derivative separators were installed to treat contaminated water. At its peak the construction work required 50 subcontractors and more than 4,500 workers. Konin to Wrzesnia opened for traffic on 22 December 2002, Wrzesnia to Poznan Krzesiny on 27 November 2003, and Poznan Komorniki to Nowy Tomysl on 27 October 2004. The second section of the A2 motorway project was built using latest concrete technology and features a specially designed concrete pavement. More than one million cubic metres of concrete was used to build this section. Traffic safety and monitoring equipment has been installed to ensure the road was up to scratch for the most demanding situations. "The A2 motorway will run through Warsaw to connect with Germany in the east and Belarus in the west, as a part of the planned East-West Trans European motorway Berlin to Moscow route (part of the E30)." EGIS Projects, a subsidiary of Groupe EGIS, was responsible for the supply and installation of all the fixed operating equipment for toll systems, telecommunications and traffic management systems. KWH Pipe Poland supplied cable jacketing and conduit pipes up to diameters of 1,600mm for all electric and telecommunications cables installed during the project. Three state-of-the-art toll plazas were constructed and use modern tagging devices and cash payment technology to maintain a steady throughput of vehicles. The toll plazas are located in Ladek (Konin to Wrzesnia section), Nagradowice (Wrzesnia to Poznan section) and Goluski (Poznan to Nowy Tomysl section). At each toll plaza there are five lanes in each direction for customer vehicles and a service lane reserved for maintenance and emergency vehicles. Drivers may pay cash or purchase a discount card for multiple journeys. Tags can be obtained from the operating company by arrangement. Following the Toll Motorway Act of July 2005, trucks of up to 3.5t can use the A2 motorway free-of-charge providing they display a valid road charge card (vignette) which is usually purchased as a type of road tax. However, this has become a controversial issue and is the subject of a dispute between AWSA and the Polish Government. The Poznan bypass lies just south of the city of Poznan and consists of 13.3km of dual lane carriageways. The road construction was financed by loans from the European Investment Bank (EIB), Polish budget and European Union grant aid and supervised by the GDDKiA. The bypass runs from Poznan Krzesiny to Poznan Komorniki, has 22 bridges and the potential in the future to be widened to three lanes making use of an overly large central reserve. The road is toll free in deference to a condition of the European Union grant. Construction was project managed by Scott Wilson in conjunction with JPP Consult of Wroclaw and the road was designed by Transprojekt-Poznan. Construction was carried out by STRABAG Polska and NCC Polska and 40 subcontractors using 650 workers. The road was opened for traffic on 12 December 2003 as a freeway. AWSA was the consortium of Polish companies with responsibility for the overall control of operations and construction for the A2 toll project. AWSA entered into a 37-year build-operate-transfer agreement which will give them overall responsibility for the road, collecting the tolls and servicing the debt. Financial backing (November 2000) was a package put together via a series of long-term loans from major banks across Europe, including €235m (26%) from Commerzbank and Credit Lyonnais, a long-term €275m (33%) loan from the EIB, with the Polish state treasury as guarantor, and sponsor equity of €235m (26%). The remainder of the finance (15%) came from toll revenues. The road cost €637.5m in direct construction and design costs – 73% of the total, a lumpsum turnkey contract price. The remainder will be spent on preparing the motorway for operations, the provision of essential equipment, the operator’s fee for operation and maintenance during construction, servicing of the loans and a further €20m to the Polish state treasury for rent and concession fees. The lawyers arranging the finance deal for AWSA were Baker & McKenzie Gruszczynski i Wspolnicy and the company retained by Commerzbank and Credit Lyonnais to carry out a technical due diligence review were the Louis Berger Group.